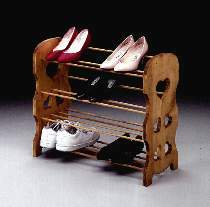 End closet clutter with this charming Country Shoe Rack. 22"H x 11"D. Patterns drawn FULL SIZE. Order fourteen 3/8" dowels if you want two high heel and two flat heel shelves. Order 16 dowels for 4 flat heel shelves.